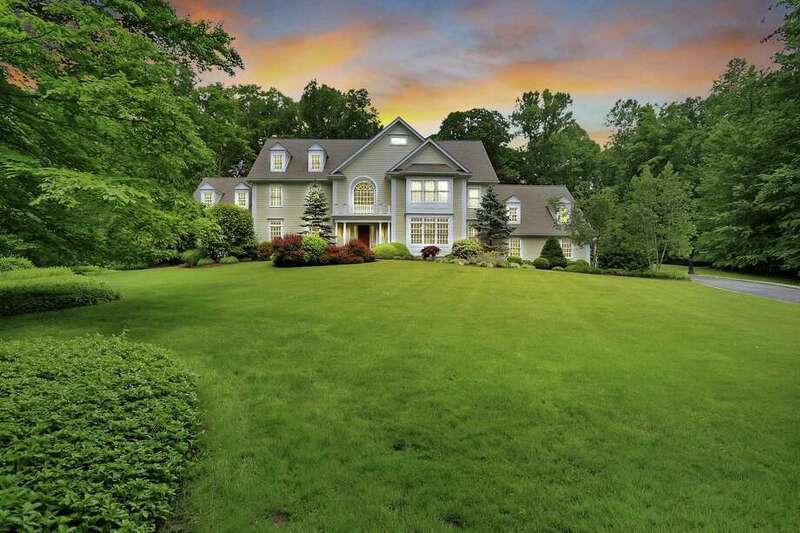 The front lawn of this attractive property serves as a welcome mat to this custom-built colonial home. FAIRFIELD — There is a custom-built colonial house in The Ridge that is as poetic and graceful as the name of the street on which it was built. The 12-room, Energy Star-rated house sits on a level property of more than three acres at 180 Morning Dew Circle. The street name and the attractively landscaped property seem suited as a faerie bower, yet this house and property are rooted not in fantasy but in practical and luxurious living. Although it was constructed in 1996, this elegant house is as well-maintained, well-equipped, and able to accommodate modern-day living and entertaining as those houses that were more recently built. And it’s hard to find the equal of its gated community with all the amenities afforded to its residents. The Ridge is nestled in Greenfield Hill on the former Pepperidge Farm property near the border of Westport. It is one of Connecticut’s only communities with 24-hour security and concierge staffing services at the stone gatehouse that stands at the entrance into the family-friendly neighborhood of more than 90 homes. The Ridge provides for its residents a country club lifestyle that includes a 2,400-square-foot club house or recreation center, two professionally maintained tennis courts with lighting for evening play, and a Gunite in-ground swimming pool. A brochure of The Ridge indicates this community has 5 miles of private roads and cul-de-sacs, “where children can play safely.” The community also features a playground or tot lot. Special events and functions for children, adults and families are numerous and include movie nights, holiday parties, barbeques, clambakes and a summer camp program for children. The adjacent Audubon Society nature reserve has hiking and bridle trails that connect to Fairfield’s municipally owned trail system. As if The Ridge is not private enough, this house sits at the end of the cul-de-sac set back from the roadway. A long paved driveway lined in Belgium block passes the expansive and welcoming front lawn and leads to the attached three-car garage, ample parking area, and patterned red brick path to the covered front entrance. The door, flanked by tall sidelights and topped by a large Palladium window, opens into the sizable two-story foyer and 7,302 square feet of living space on three finished floors. Flush fluted columns mark the wide entryways into the formal dining room to the right and the formal living room to the left. Straight ahead, French doors with multiple glass panes, topped with an interior transom, open into the gourmet kitchen. In the formal living room, there are built-in cabinetry and shelving, a door into the family room, and a sophisticated “coastal modern” decor in white and blue tones; perhaps a reminder that despite this seemingly remote location the Fairfield shoreline is not very far away. From there the easy circular flow from room to room continues into the great room, and then into the family room, the latter of which is open to the eat-in kitchen. The kitchen provides direct access into the dining room, separated only by French doors. The floors of the living, dining, and great rooms all feature a double walnut in-laid border in the hardwood floor. The great room features three walls of windows, a tall vaulted ceiling, and a wall of built-ins. In the family room there is a floor-to-ceiling stone fireplace and built-in entertainment or media center. Step up passed the two columns into the eat-in area of the kitchen, where there is a wet bar with a granite counter, cabinets, and wine refrigerator, and sliding doors to the over-sized mahogany deck and backyard. In the kitchen features include an oversized island/ breakfast bar, Ogee-edged granite counters, built-in desk area, walk-in pantry, top-of-the-line appliances, and a backsplash of ceramic tiles — some of them hand-painted and depicting stylized birds and butterflies. There are two half baths on the main level. Upstairs, there are five bedrooms, three en suite and two sharing a Jack-and-Jill-style bath. The master suite features a fireplace, a deep tray ceiling, wainscoting on the lower walls, and two walk-in closets. Its spacious marble bath has a double-sink vanity, jetted tub, and a large glass shower. The third floor has a home office with window seats, home gym, and a full bath. For more information or to set up an appointment to see the house contact Shoshana Snyder of Snyder & Pritchard Homes/William Raveis Real Estate at 203-307-4562 or Shoshana.Snyder@raveis.com.